We’re LIVE at Disney’s Hollywood Studios today checking out all of the Flurry of Fun holiday treats, and we found a super fun sweet treat at Oasis Canteen — Santa Macarons! 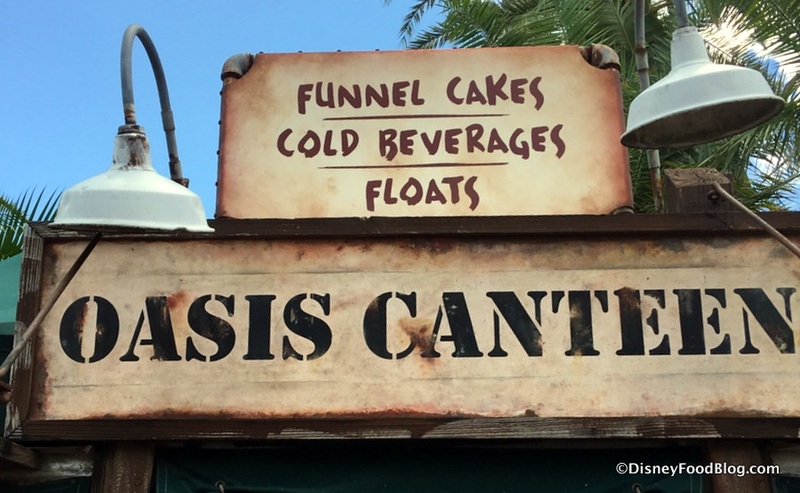 Oasis Canteen is an Indiana Jones-style snack spot where guests at Disney’s Hollywood Studios can pick up funnel cakes, cold drinks, and floats. We love the design of the kiosk, with its industrial details and aged signs. And right now, there’s a totally indulgent funnel cake on the menu that you’re definitely gonna want to add to your how-much-sugar-can-I-eat-on-vacation list (we’re not the only ones with one of those, right? ): Cookies & Cream Funnel Cake! We’re baaaaaack with more What’s New! This time we’re at Disney’s Hollywood Studios where the Incredibles are popping up everywhere and at Disney’s Coronado Springs Resort where tower construction is well on its way! So c’mon! It’s hot in central Florida, and it isn’t cooling off any time soon. So you’ll want to keep your cool by sipping on a Strawberry Lemonade with an optional shot of Bacardi Dragon Berry Rum. We found this at the popcorn cart to the left of the Chinese Theater. 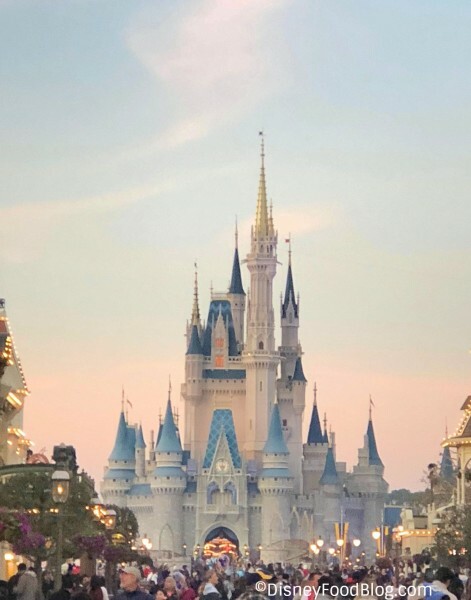 We were able to do a dream trip to the Walt Disney World Parks for spring break. Let’s just say it was a busy week, but oh so awesome! Our family of four had the time of our lives discovering the happy Disney atmosphere, the rides, and of course the FOOD. In our family, we LOVE Disney because they are really good about offering safe options for those with food allergies. In this post, I thought I would share some of the absolutely delicious snacks we found that are safe for peanut and tree nut allergies. Keep in mind that you should always check whether a snack continues to be safe and if it’s safe for your allergies, because things can change at any time. Disney provides an “allergy binder” or “allergy menu” at every food station that shows the ingredients of every item and what the allergens are. We got used to asking to see the allergy binder before we bought & ate anything. Even though baked goods safe for guests with peanut and tree nut allergies are not plentiful, this one makes up for it by itself! The flavor of cinnamon and sugar surround a crisp, cake-like batter. 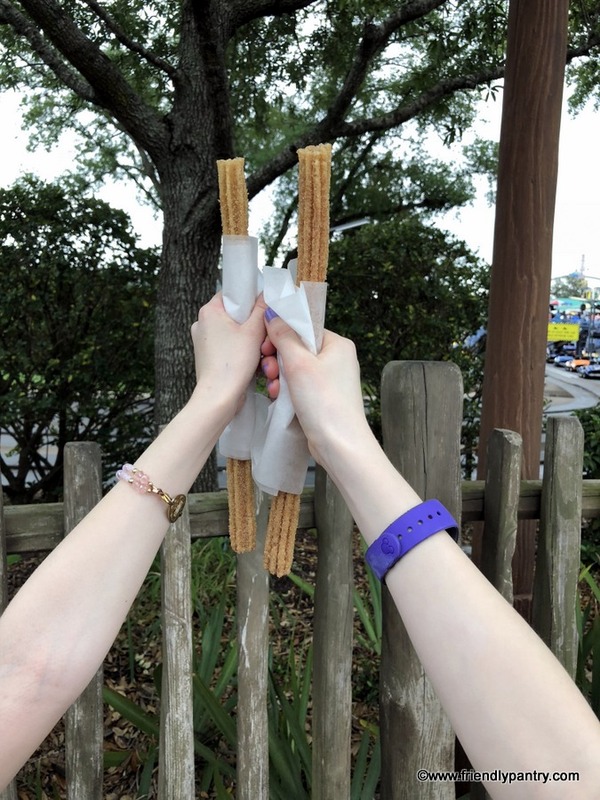 You can find churros at several of the small food stands scattered throughout the Parks. Yum! Additional churros can be found these Walt Disney World locations: Pecos Bill Tall Tale Inn and Cafe, Dino Diner, Anaheim Produce, Auntie Gravity’s Galactic Goodies, Cool Ship, Storybook Circus Pretzel Cart, and The Lunching Pad. So what’s better than a baked good? A baked good with ice cream! Safe ice cream can be difficult to find for people with peanut and tree nut allergies in general, which is why this treat is so special. It combines two hard-to-find goodies into one over-the-top treat. This goodie is especially perfect to cool you down in the heat of the day, and you can find it at Oasis Canteen. 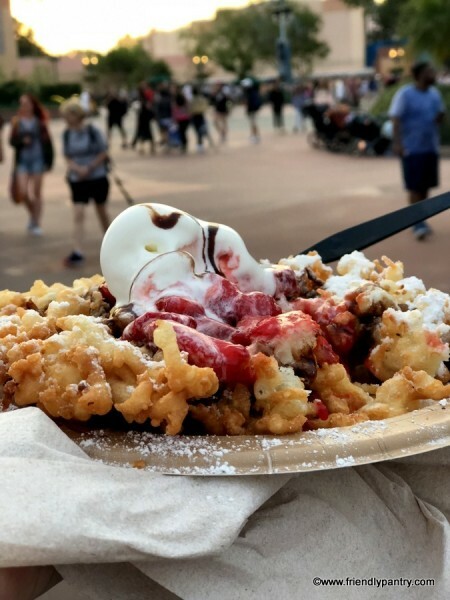 If you’re touring other areas of Walt Disney World, you’ll find more funnel cakes on the menu at the Funnel Cake Stand in Epcot’s American Adventure Pavilion, Sleepy Hollow Refreshments, and the Funnel Cake Kiosk along Disney’s BoardWalk. We were lucky to be at Disney during Epcot’s International Flower and Garden Festival which runs until May 28, 2018. During this time there are additional “outdoor kitchens” throughout World Showcase. 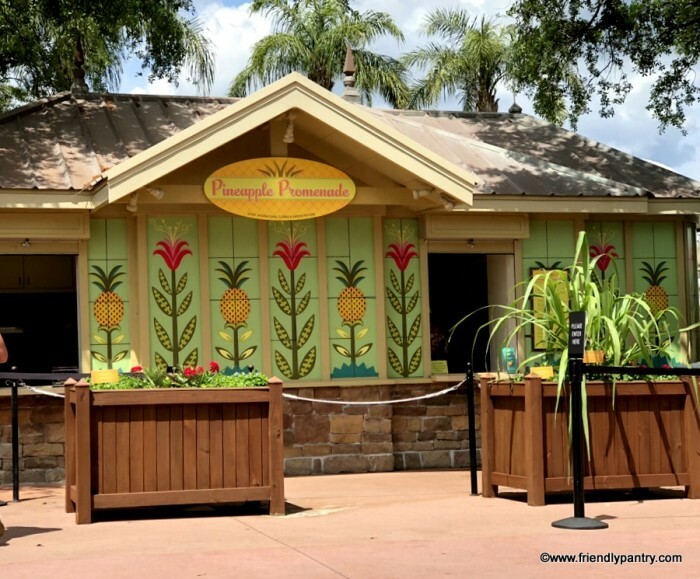 One of the outdoor kitchens we visited was Pineapple Promenade. 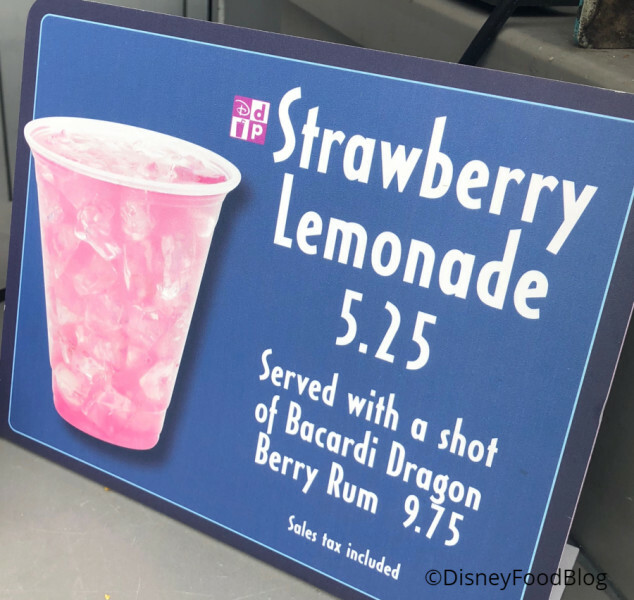 Not only could you get Dole Whip here but they also had a selection of unique and refreshing drinks. 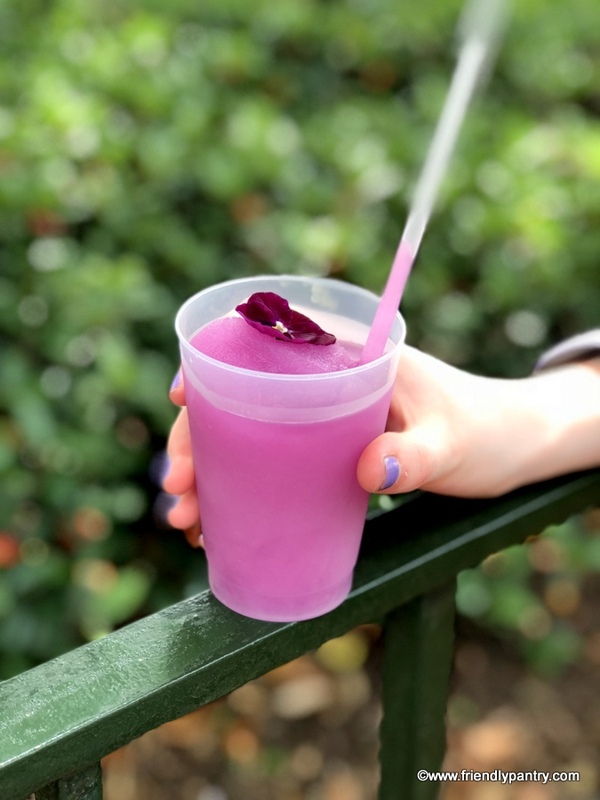 We opted for the allergy-friendly violet lemonade. Complete with a gorgeous and edible violet right on top! In our family, a vacation to Disney isn’t complete without consuming copious amounts of Dole Whip. My kids were talking about it for quite awhile before we went. Which is why Tamu Tamu Refreshments in the Africa area of Disney’s Animal Kingdom was such a welcome sight for us. 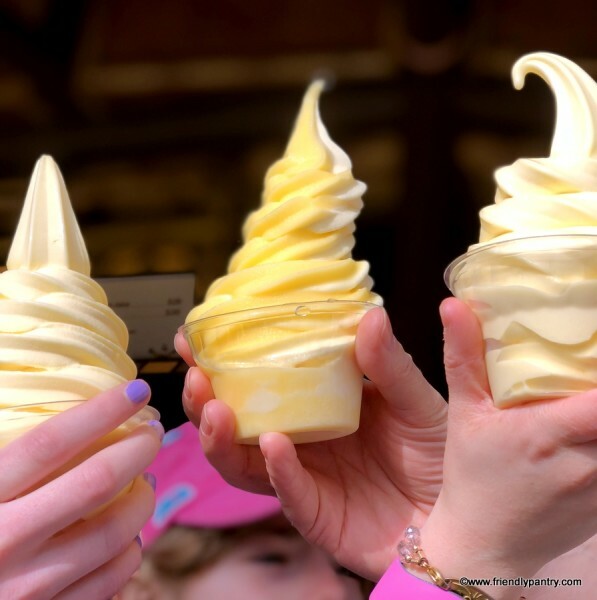 It was an easy decision; Dole Whip it is! Need more Dole Whip? This tasty treat can also be found around Walt Disney World at Aloha Isle, Pineapple Lanai, Barefoot Pool Bar (served with rum), Marketplace Snacks, and Everything Pop food court. 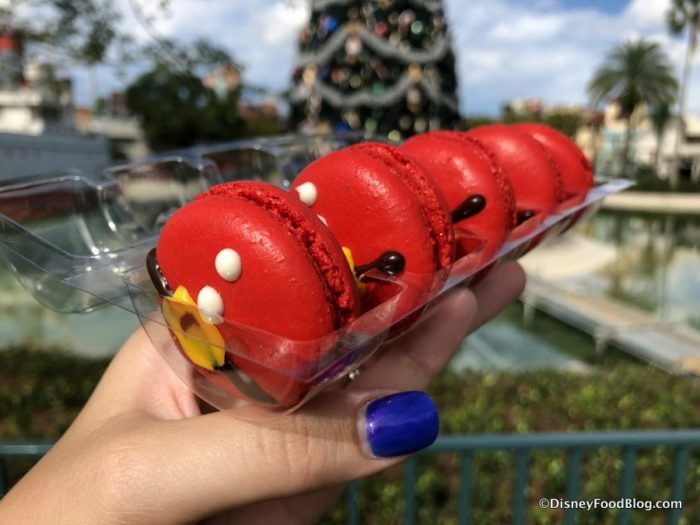 What delicious goodies have you found at Walt Disney World that are safe for peanut and tree nut allergies? 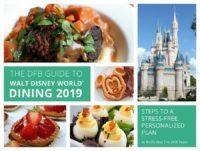 Further information on dining at Walt Disney World with special diets can be found on DFB’s Special Diet page. 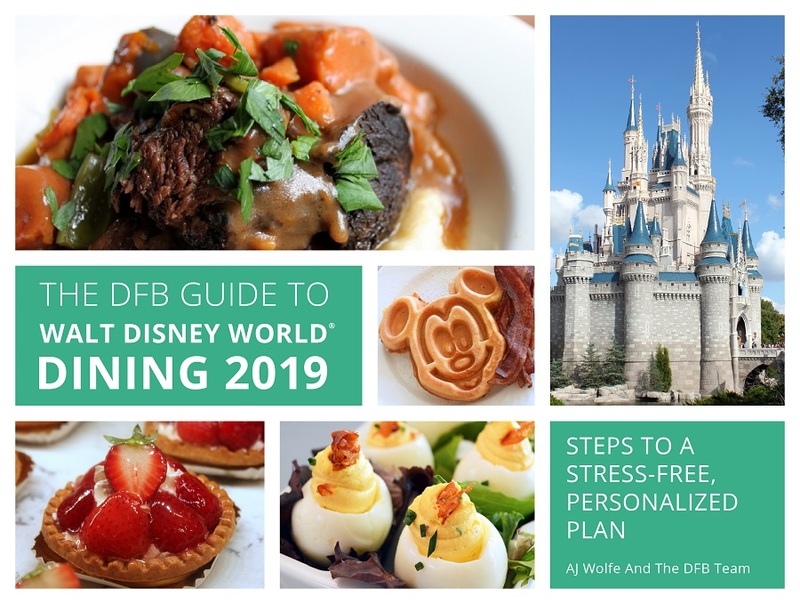 Plus, check out our DFB Guide to Walt Disney Dining for more information on Special Diets at Walt Disney World. Note that Disney Food Blog is not liable for issues encountered with allergies in Disney World. Please do your research and due diligence. 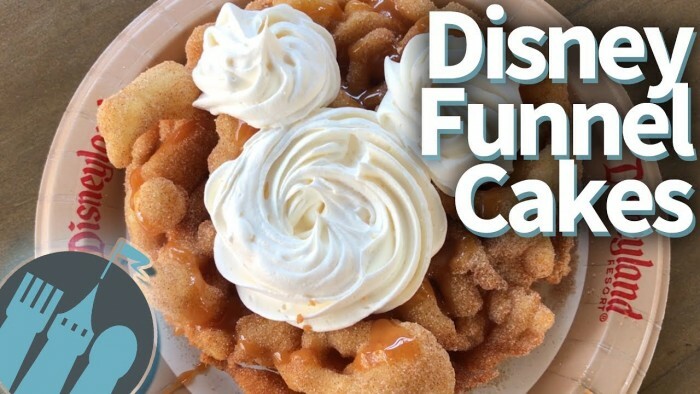 New DFB Video: Ultimate Disney Funnel Cakes in Disneyland and Walt Disney World! Hey Guys! We’re back with another DFB Video today, and we’re getting down to the serious business of Funnel Cakes! But not just any funnel cakes…we’re talking Disney Funnel Cakes!! Every once in a while you’ve gotta go back to the classics. 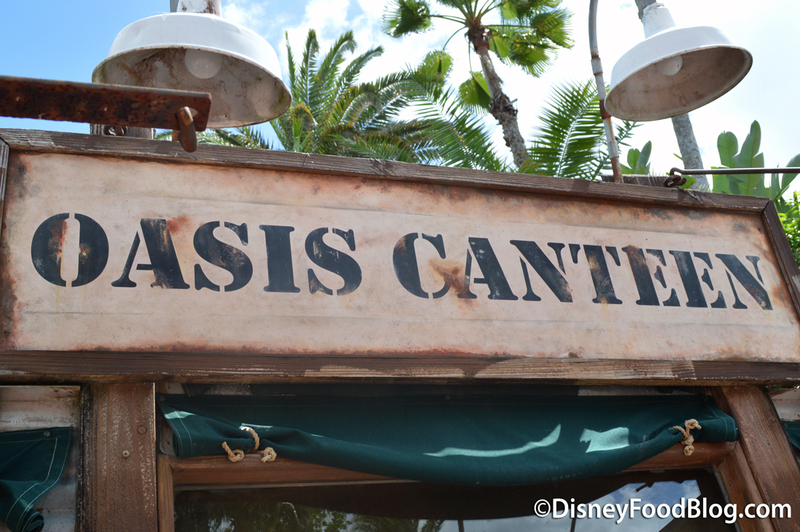 Let’s head over to Disney’s Hollywood Studios to Oasis Canteen! You’ll find this unassuming little kiosk in the back of Studios, near the Indiana Jones attraction. Ice cream treats are the norm for this place. But at least once in the past, they took us by surprise when they offered a selection of savory options. 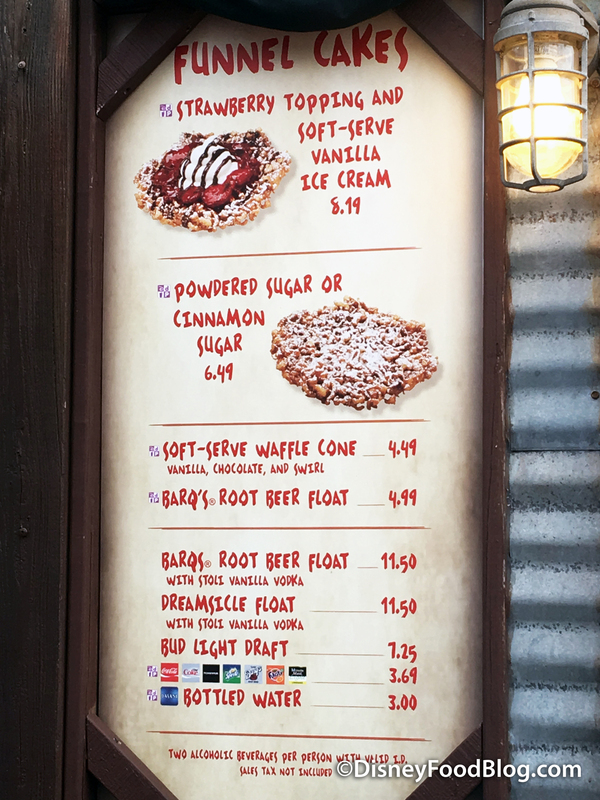 That was mostly during a busy season when more eats were needed around the park, and since then ice cream and classic treats have returned. 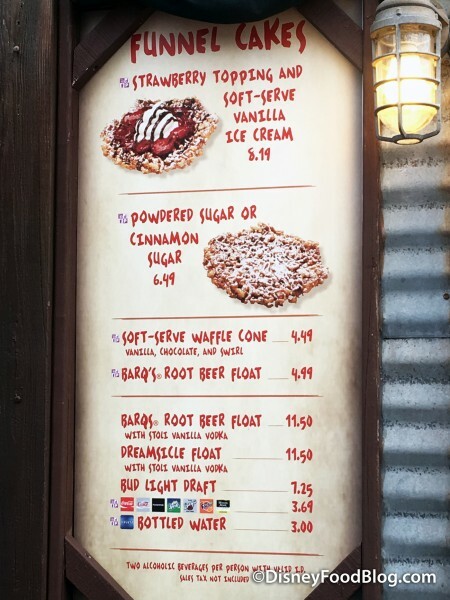 In fact, the menu has changed very little from long ago visits — except that the prices have gone up. 😀 There are also a couple of grown up floats to try here — both root beer and dreamsicle versions — that include Stoli Vanilla vodka. Wow… we’re gearing up for a LOT of new experiences coming to Walt Disney World in the coming weeks. 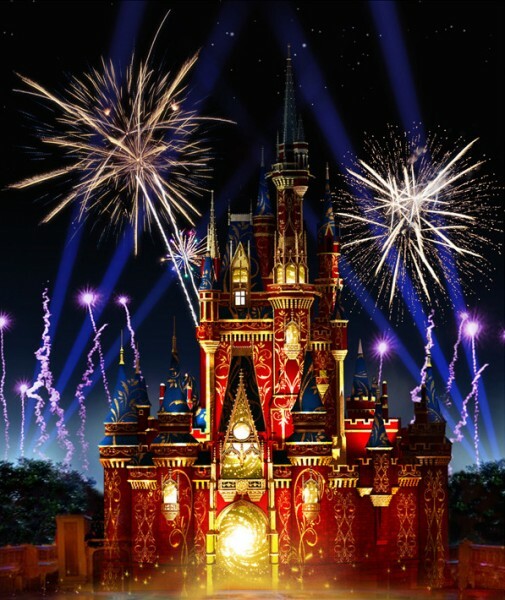 Next month, the new “Happily Ever After” nighttime spectacular will make its debut in Magic Kingdom, and Animal Kingdom will unveil an entire new LAND with Pandora — The World of AVATAR! But, as always, there is plenty taking place in the here and now in Disney World, too. So, let’s take a look around the parks and resorts to find out What’s New! 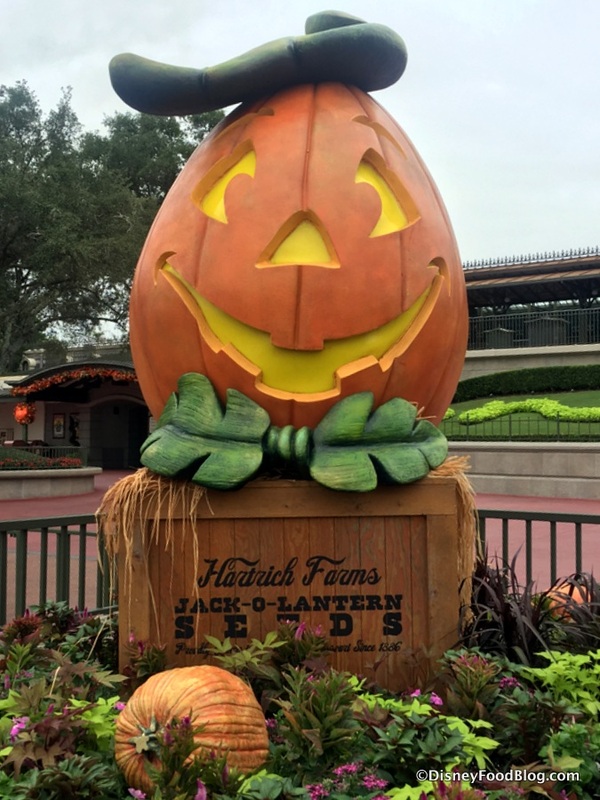 The Halloween decorations are up and the 2016 Epcot Food & Wine Festival is ON! It MUST BE FALL in Walt Disney World! Hollywood Studios has really been changing things up on us lately! Of course, we saw some of this coming with fair warning: we knew that several Counter Service spots would be closing in early April to make way for the construction of Star Wars and Toy Story Lands. So far, construction has most affected the former Streets of America section of the park, and the remaining dining location in that area — Mama Melrose’s Ristorante Italiano — is now part of the recently renamed area of Muppets Courtyard (meanwhile, its nearby neighbor, Toy Story Pizza Planet, is closed for a major makeover of its own). Suddenly down a few dining locations, rumors of additions are starting to swirl (like a possible themed bar coming to the Twilight Zone Tower of Terror attraction). That’s just a glimpse of some of the changes around the park. And as much as these changes are highly likely to result in a really great experience once the new Lands are complete, it’s all enough to make you want to visit a tried-and-true spot and soak in some familiarity. So it came as a fairly big surprise when one of those tried-and-trues revealed an entirely new menu on our most recent visit. The Oasis Canteen (located near the Indiana Jones Epic Stunt Spectacular) has been the Hollywood Studios home to the theme park staple of Funnel Cakes for years. It’s time for another Trip Around the World to check out all the latest eats and happenings… and maaaaaybe a couple of construction walls, while we’re at it ;). Because while April showers might bring May flowers, this month is also bringing LOTS of changes to the Disney World parks! 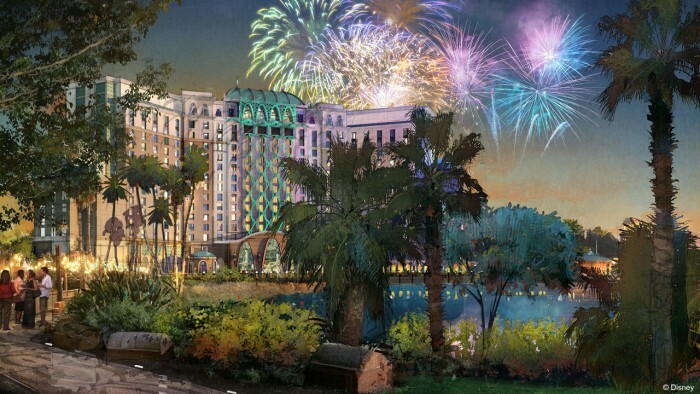 It’s already been over six months since it was announced that MAJOR changes are on the way to Disney’s Hollywood Studios with the construction of Toy Story and Star Wars Lands.